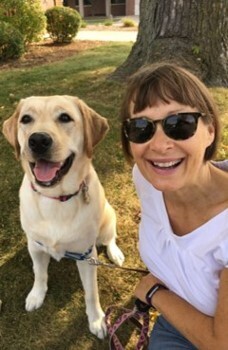 I am a Madison native who has enjoyed being a Speech-Language therapist for over 30 years. I am devoted to my family and love mentoring other mothers. I am often found dancing Zumba, doing Yoga, taking long walks, paddle or snowboarding as well as being curled up with a book, tracking fashion trends or deep in meaningful conversation with friends. Why WAGS? 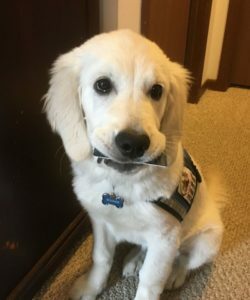 I had the inside scoop when friend with a WAGS service dog recommended it as a great organization. She was exactly right. The training WAGS pours into their puppies and puppy-raisers is rich. There is so much to learn and it comes at a pace that makes it very interesting and manageable. I find it all totally fascinating. I am sure that I’ve learned as much about myself in taking on this new adventure as I have about training dogs. Favorite Memory? I love the way that every member of our family shares puppy stories with each other throughout the week. 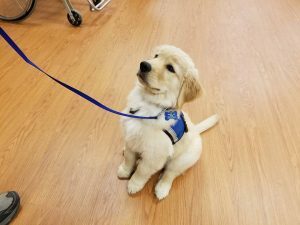 We are all amazed at how a pudgy, uncoordinated 8-week-old puppy turns into a skillful, mature dog so quickly through kind, positive training. 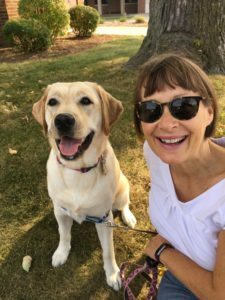 Our service dog has become a meaningful and delightful (temporary) member of our home. 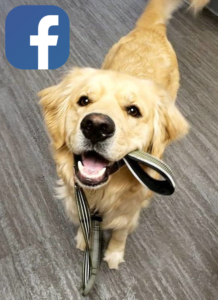 WAGS dogs learn to work while having their doggy nature cared for and encouraged. These are happy animals! They have both joy in living and joy in serving. Volunteering is a great way to learn that volunteering for others can also bring you great joy. We all see how practice and persistence in training pays off. I wouldn’t trade the experience for anything. A note of caution: This can be addictive and the swelling of love in your heart is very noticeable. 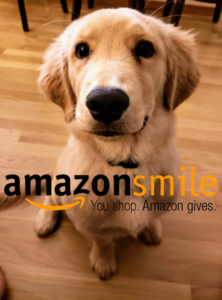 YOU SHOP & AMAZON DONATES TO WAGS!